When I lived in Phoenix, I could never understand the fascination with spring. Phoenix has pretty much just one season, sunny! So, when I moved to Texas, it was amazing to see red-breasted robins show up at our house every spring and watch the forest and greenbelts around me come alive with pale green leaves. Now I can’t wait for spring to arrive. As a bargain hunter, spring is here and with it comes lots of fun and activity in April – and lots of great things on sale. Don’t let the joke fall on you on April 1. April sales are no laughing matter! A few important dates: Easter is April 1. Taxes are due April 15. Earth Day and Administrative Professionals Day is April 22. Arbor Day is April 27. TIP: Expect a tax refund this year? Now is the time to start thinking how you would use any tax refunds you may receive. You might want to use it toward a higher-priced item for your preps: a Berkey water filter, several WaterBricks, or stocking up on freeze-dried food. The biggest food sales are going to happen right after Easter. Ham, candy, baking items (like flour, yeast, chocolate chips, mixes, and frosting), eggs, mustard, pre-made bread and dough, pies and pie crusts should be on sale. Organic foods and mushrooms are also April food sale items. You should find deals on produce like lettuce, red peppers, and tomatoes if the weather stays warm where they are grown. One friend buys pastel-colored Easter candies and then uses them for different holiday celebrations during the year. Pink foil wrapped Hershey Kisses, for example, are perfect for Mother’s Day, a wedding shower, or a girl’s birthday party. Pastel M&Ms can be separated into different colors for different holidays and celebrations. If you’ll be storing chocolate candies long term, be sure to check out the video at the bottom of this article. Indoor kitchen appliances will go on sale as people move to cook outside with nice weather. Consumer Reports can help you compare appliances, models, prices, and product reviews. Cookware, cookie cutters and Easter-themed linens, plates, and supplies round out the kitchen deals for the month. Pastel colored paper goods are nice for stocking up since they can be used for birthday parties, wedding and baby showers, Mother’s Day, and more. Rain gear, swim gear, spring clothing, sneakers, and winter gear (coats, boots, clothing) go on sale in April. Winter bedding is also on sale before it clears off the shelves. Spring beauty products will also be on sale. If you find these at super-bargain prices, they’re great for stocking up, long-term since they generally have long shelf lives. Looking ahead, they can also be fun stocking stuffers. Spring cleaning will prompt sales of organic and natural cleaners, as well as vacuums. Deals can also be found on home improvement supplies this month. With spring storms and hurricane season ahead of us, check into what supplies you might need to storm-proof your home. It’s better to do it now before your home is actually hit with the devastating weather. Sales after Easter can supply various crafts and gifts for the upcoming year – baskets, ribbon, decorations, toys and stuffed animals will be on sale. Almost anything that can be used to fill an Easter basket can be used for future birthday party gifts, a rainy day craft or even stocking stuffers. Also, Easter outfits can be bought for future fancy occasions, like upcoming weddings, or for next year’s holiday in a bigger size or two. Gardening season is upon us! Even if you live in the northern part of the country, you can still start planning your garden and ordering seeds, tools, and supplies. Check out this article for my recommendations for the most important garden gear to have on hand. Lawnmowers will be on sale this month before the grass starts growing long and people need them. Garden supplies and outdoor furniture will be on sale as well. Garden centers and nurseries will probably have good deals on loss leaders to get people into their locations with the hopes that they will buy more, so check their websites and advertisements to find the best bargains. I always recommend the mom-and-pop type nurseries. It seems their employees are not only better educated when it comes to gardening but they will have information and tips specific to your area. Gardening can get expensive and cause you to think twice about putting out a ton of money for a couple dozen tomatoes and a lone eggplant! This article has some excellent tips for saving money this year on your backyard garden. Car care is also an April deal focus. Tires, auto parts, and car care supplies will be on sale. Planning a road trip this summer? Prices might be at their lowest for getting your vehicle all prepped and ready for a safe trip. April is a good month to look at electronics because it is the end of the fiscal year in Japan. Computers, laptops, TVs, tablets, digital cameras, etc., are among the items that will have discounts. Think ahead to upcoming gift-giving holidays – Mother’s Day, Father’s Day and graduations – and see if you can find a good deal, along with their accessories. For preparedness uses, ebook readers, loaded up with survival manuals, fiction, and free classic novels are perfect for Faraday cage storage. Indoor fitness equipment will still be on sale this month as people start exercising more outdoors with nice weather. You may see deals on summer activity gear as the stores start gearing up for the season – kiddie pools (see 15 prepared uses for kiddo pools), sidewalk chalk, bicycles, and swim gear. April is Stress Awareness Month and with that comes Spa Week! Spas across the country will offer 1-hour massages for $50. For more information, visit www.spaweek.com. Check local events for any Arbor Day or Earth Day celebrations. Some communities will offer free festivals with family-friendly events, and there might even be free plant or tree giveaways. Also, check your local nurseries or parks for free gardening classes. You can even try doing an Internet search for free seeds and see if any companies are giving away sample seeds. There have been a few giving away free seed packet for bee and butterfly gardens. Home improvement stores will start offering free classes for children on the weekends. National Parks offer free access April 21 to celebrate the opening weekend of National Park Week. If you are thinking of going on vacation, now is the time to contact the local chamber of commerce or visitor’s center and ask for free brochures and see if they have any free events coming up. As you do your spring cleaning, assess what you have and see if you have enough to do a yard sale. 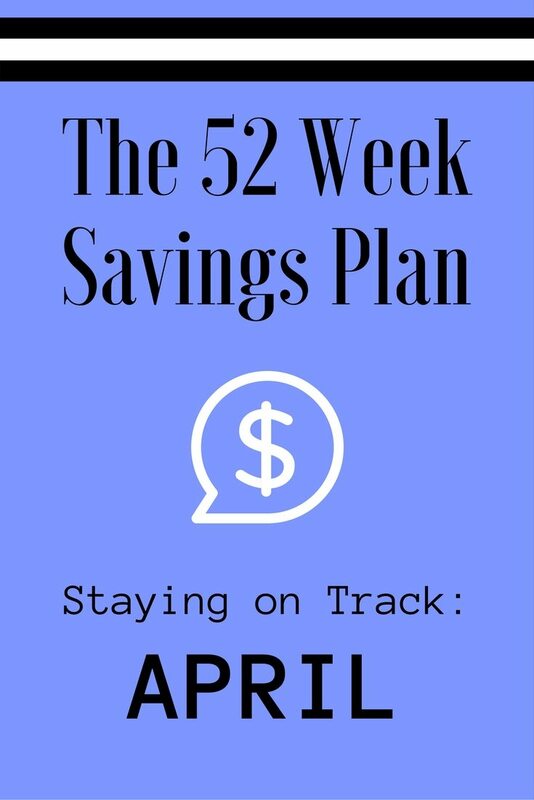 By the end of April, you should have $153 saved if you’re following the weekly savings plan (17 weeks). If you have extra right now, perhaps going to a higher week in the chart and putting that money away would be a smart thing to do. Take advantage of April’s deals and enjoy the sunshine spring brings. Come back next month to see what deals May offers to help you save AND prepare! For more tips and support, join my Facebook group, The 52 Weeks Savings Club.